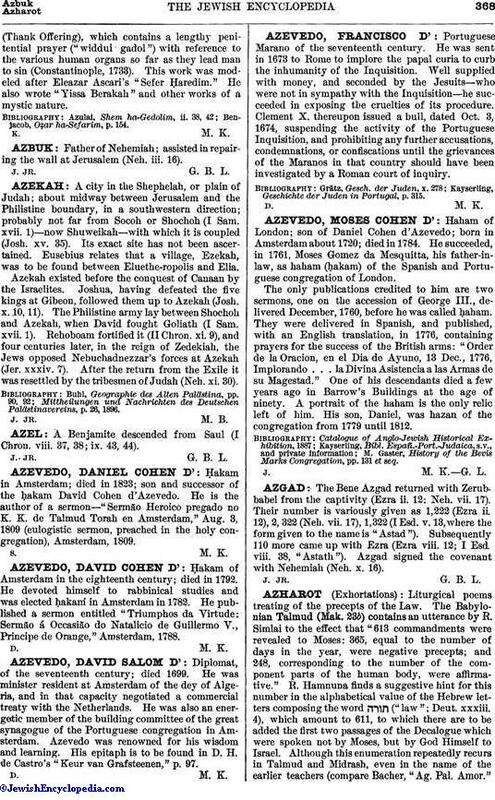 Haham of London; son of Daniel Cohen d'Azevedo; born in Amsterdam about 1720; died in 1784. He succeeded, in 1761, Moses Gomez da Mesquitta, his father-in-law, as haham (Ḥakam) of the Spanish and Portuguese congregation of London. The only publications credited to him are two sermons, one on the accession of George III., delivered December, 1760, before he was called ḥaham. They were delivered in Spanish, and published, with an English translation, in 1776, containing prayers for the success of the British arms: "Order de la Oracion, en el Dia de Ayuno, 13 Dec., 1776, Implorando . . . la Divina Asistencia a las Armas de su Magestad." One of his descendants died a few years ago in Barrow's Buildings at the age of ninety. A portrait of the haham is the only relic left of him. His son, Daniel, was hazan of the congregation from 1779 until 1812. M. Gaster, History of the Bevis Marks Congregation, pp. 131 et seq. J. M. K. G. L.